Before this year’s SXSW event kicked off, a number of bloggers suggested that this year’s breakout hit might be foursquare, a new location-based social application with a gaming twist that was created by the guys behind the now-defunct Dodgeball service. As the ‘interactive’ section of the festival winds down, I think it’s safe to say that foursquare was not the must-have app of SXSW the way Twitter was two years ago. But it had a strong showing, and once I actually figured out which of my friends were using the service (which is more difficult than it sounds), I found foursquare to be an indispensable app during my time here. foursquare’s primary function is to help you figure out where your friends are. Users frequently ‘check-in’ with the app to update their current location, which is then broadcast to their friends. At this point the service primarily operates from its recently-released iPhone application, though users can also check-in from the foursquare website (at least in theory – more on that later). Aside from a basic ‘friend’ system, foursquare’s social features are pretty limited compared to services like Loopt and Brightkite. 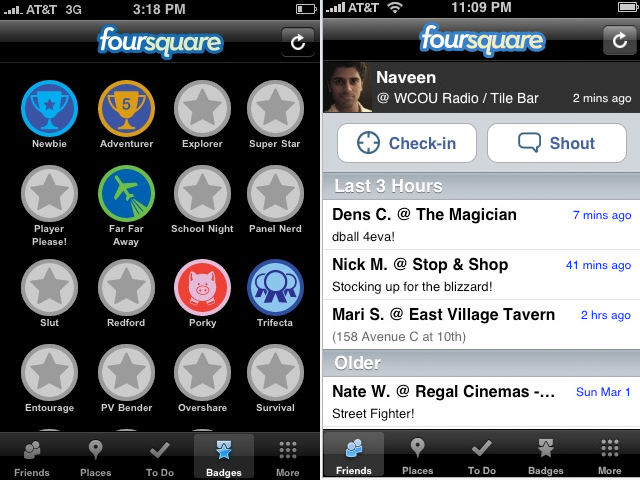 In lieu of a full-fledged social network, foursquare incorporates a gaming element, awarding users with points and merit badges for ‘checking in’ at a variety of locations. It’s here that the app really shines: these rewards give users an incentive to check-in frequently (a necessity given the fact that the iPhone can’t automatically update your location as you travel), and it’s far more fun than it sounds. Badges are awarded for completing specific activities, like venturing outside of the city limits, or checking in from a roving karaoke RV (they exist, and they’re awesome). Most badges are ambiguously named and the criteria for unlocking them is a mystery, which makes ‘figuring out’ how to earn them a fun game in itself (some of the criteria for the badges at SXSW began to spread virally at SXSW, and were often the topic of bar chatter). By the end of my week here I found myself ignoring the points system altogether – points seem to be awarded for totally arbitrary reasons and my rank of 240th on the service’s leaderboard was discouraging. But my desire to unlock more badges never waned. foursquare is surprisingly fun and addictive, but the application has some really annoying flaws that may have kept it from reaching its full potential at SXSW. For one, inviting your friends to join is far more painful than it should be. There’s no way to use phone numbers in your address book to see if your friends have registered, nor can you send your friends invitations to join from within the app (I eventually resorted to manually Emailing my friends). And the foursquare website oddly has even less functionality that the iPhone app. The developers are well aware of these omissions (most of them were dropped as they tried to get the application ready in time for SXSW), but that didn’t make them any less frustrating. The real test for Foursquare begins now that SXSW is winding down. The awards system worked perfectly for the five-day event, but I feel like any sense of urgency to earn badges will be gone once everyone heads home. That said, Foursquare could easily build a business centered around multi-day conferences and concerts, creating customized branded applications for each event (it could even potentially charge restaurants and other POIs that wanted to get listed as one of the event’s badges). Foursquare was built by the guys behind Dodgeball, an early location-based social network that was acquired by Google in May 2005 and languished there until it was finally axed in January. The new service have quite a few similarities, though foursquare benefits from the GPS and slick interface afforded by the iPhone.